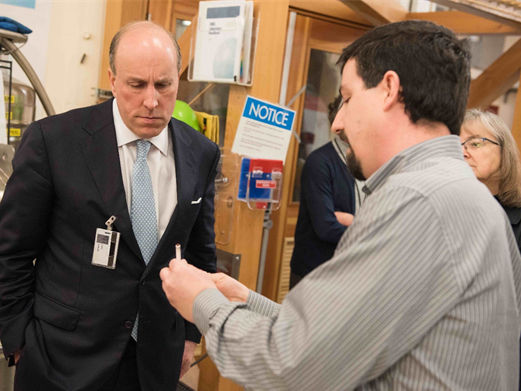 Under Secretary Paul Dabbar and Chief of Staff Kristen Ellis toured Pacific Northwest National Laboratory on February 6-7, 2018. During their tour, they met with scientists from the Center for Molecular Electrocatalysis, an Energy Frontier Research Center. In talking with Dr. Aaron Appel and others, they learned about the latest research into catalysts that interconvert electrical and chemical energy, including bio-inspired molecular catalysts for hydrogen production. Dabbar serves as the Department of Energy's principal advisor on basic research and energy technologies. As part of his portfolio, Dabbar oversees the Office of Science and its national laboratories. Before his confirmation as Under Secretary, he worked in operations, finance, and strategy roles in the energy sector. A graduate of the U.S. Naval Academy and Columbia University, he served as a nuclear submarine officer at Mare Island, California, and Pearl Harbor, Hawaii.